Prime Minister Tony Blair has vowed the UK will not be intimidated after blasts hit London's transport network. 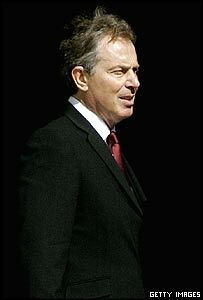 Mr Blair said: "It is a very sad day for the British people but we will hold true to the British way of life." The prime minister flew to London from the G8 summit, which continued in his absence. He rejoined the talks in Gleneagles on Thursday evening. A statement from G8 leaders called the blasts "an attack not on one nation but on all nations and civilised people". The Queen said she was "deeply shocked" and sent sympathy to those affected. US President George Bush said there was an "incredibly vivid contrast" between the work at the G8 to alleviate poverty and the "evil" of those wanting to kill. Foreign Secretary Jack Straw chaired the G8 talks while the prime minister went to London to chair Cobra, the committee involving ministers, emergency services and security agencies. Mr Straw said the blasts bore the "hallmarks of an al-Qaeda related attack". The prime minister said there would be the "most intense" police and security service action to ensure those responsible were brought to justice. In a televised message from Downing Street, Mr Blair sent "profound condolences" to victims' families and to those injured in the blasts and he thanked the emergency services. "It is through terrorism that the people who have committed this terrible act express their values and it is right at this moment that we demonstrate ours," said Mr Blair. "They are trying to use the slaughter of innocent people to cow us, to frighten us out of doing the things that we want to do, of trying to stop us going about our business as normal as we are entitled to do. "They should not and they must not succeed." Mr Blair said those behind such attacks claimed to act in the name of Islam but he stressed that the vast majority of Muslims abhorred terrorism as much as anyone else. "We will not allow violence to change our society and values nor will we allow it to stop our work at this summit." 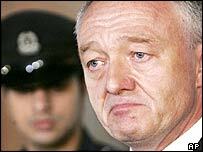 London Mayor Ken Livingstone said the attacks were a cowardly and indiscriminate attempt at mass murder which would fail in its bid to destroy free society. The mayor added: "They seek to turn Londoners against each other... London will not be divided by this." Conservative leader Michael Howard and Liberal Democrat leader Charles Kennedy both sent their sympathies to those injured and the families of those killed. They praised the "heroic" work of the emergency services. Mr Howard said it was a "dreadful day for London and for our country" and pledged his party's full support for the government. "This country is completely united in our determination to defeat terrorism and to deal with those who are responsible for the appalling acts that we have seen today," he said. "The moral contrast between those who seek to disrupt and destroy and those who are trying to build for the future [at the G8 summit] could not be more stark. The terrorists must not prevail." The Archbishop of Canterbury, Rowan Williams, said "solidarity and common purpose is vital for us all at this time of pain and sorrow and anger". Scotland's First Minister, Jack McConnell, condemned the "atrocities". He said extra precautions would be taken in Scotland but there was no additional "specific" threat and the focus would be on the G8 summit. Welsh First Minister Rhodri Morgan said the whole of Wales would "feel nothing but revulsion at these savage acts". Respect MP George Galloway said the attacks were "despicable but not remotely unpredictable". Mr Galloway said Londoners had "paid the price" of the government failing to heed security service warnings that attacks on Iraq and Afghanistan would increase the threat of a attack in the UK. But Home Secretary Charles Clarke said those responsible for such attacks simply wanted to destroy democracy and stressed the 11 September attacks in America had preceded the Iraq war.